This kit represents the Tiger commanded by ace Otto Carius in July 1944. It was a "Mid" Tiger, but slightly different to the standard "Mids" of the time. This kit is almost identical to a discontinued Cyber Hobby "Otto Carius Tiger" kit. 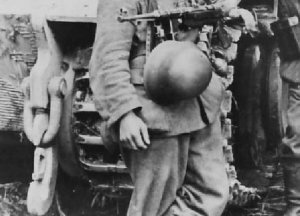 Oberleutnant Otto Carius	was de facto leader of the 2nd company of s.Pz.Abt.502 in early 1944. He commanded an "Early" Tiger until it was wrecked in April. 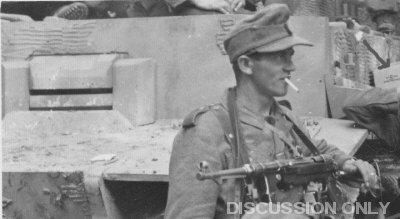 After a break for bad weather, our next evidence of Carius' vehicles is a set of photos and a newsreel from July. They show him in another Tiger, a "Mid" numbered 217. 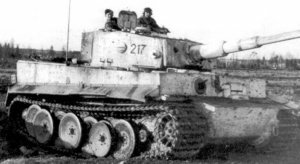 Tiger 217 had been in the company since the start of 1944. There are 2 photos showing it in whitewash with small black numerals; this is typical for winter 1943/44, so this colour scheme is not connected to Otto Carius. 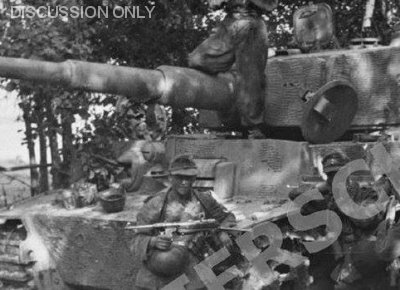 The July photos show Carius in Tiger 217 conferring with infanty and reading a map. We can't see any numbers on the turret, but some Zimmerit damage matches the earlier photos. In fact the tank has lost a lot of Zimmerit at its front. A summer camouflage scheme has been painted, making the damage less obvious. We can see that there are faint darker lines over a base colour which is probably Dunkelgelb. Carius remembered this Tiger being painted Dunkelgelb with white digits, but the photographs don't agree with his recollections. Here we can see that the turret bears no digits. The shadows of tree branches make the camouflage pattern difficult to discern here. Tiger 217 was built in January 1944, but it had a few features making it non-standard. Its front hull edges were notched, which is usually seen on "Late" Tigers. It had a "flat" mantlet originally cast for the Tiger (P). And sometime between the two sets of photographs, its standard "cleated" tracks were replaced with old "flat" tracks. The photos show that this Tiger's front outer road wheels were omitted when Carius commanded it. This kit provides the special hubs that you need to properly omit an outer road wheel.